We pride ourself on having some of the best live music in Orange County. Check out our Events page. Juicy Burgers, Crispy French Fries, Fresh Wraps... We have it all. Take a look at our Menu. Watch a game, shoot some pool, meet up for Happy Hour, throw some darts, any occasion is a good reason to come to Tumbleweeds. Tumbleweeds has a little bit of something for everyone. It's a great place for events and private parties as well. View Tumbleweeds. 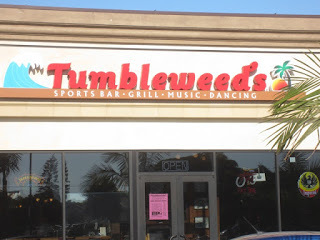 Tumbleweeds Sports Bar and Grill, is a family owned & operated restaurant and bar, located in Huntington Beach, California. Tumbleweeds is known for its casual atmosphere, inexpensive fare, and down to earth attitude about enjoying yourself. Live Music every weekend; darts, pool and having a good time daily. Tumbleweeds by Built by:The Storm Cloud Group.